Great Britain’s Paul Goodison(pictured left)added to his success in Melbourne earlier this month, by winning a gold medal at the Miami Olympic Classes Regatta, which concluded on Friday 30 January. Many of the world’s top Laser sailors were competing in the 63-boat fleet and Goodison managed to score a number of top five results that gave him a seven point win over second placed Mark Mendelblatt from America. As the only class where the sailor is yet to be selected to attend the 2004 Olympic Games, Goodison and his fellow compatriots will battle it out in Weymouth this April for the chance to represent Great Britain in Athens. Olympic gold medallist Iain Percy and team mate Steve Mitchell have had the pressure of Olympic selection lifted as their place within Team GB was granted at the world championship in Cadiz, where they finished with a bronze medal. With only seven months to go until the Games, the competition was tough in the 58-boat Star fleet and with the mixed conditions in Miami it meant that a consistent score-line would win you the regatta. Unfortunately for Team Percy/Mitchell, an overeager start in race two saw them penalised with a black flag disqualification, which meant that their discard had already been used. As the wind died off towards the end of the week they struggled to put in the results needed and finished the regatta in fourteenth place overall. The Tornado fleet attracted 29 boats and many of the top multihull sailors to Miami. After eight races it was Enrique Figeuroa and Jorge Hernandez of Puerto Rico who took the gold medal from Olympic Champions Roman Hagara and Hans Peter Steinacher of Austria and Mitch Booth and Herbert Dercksen from the Netherlands. 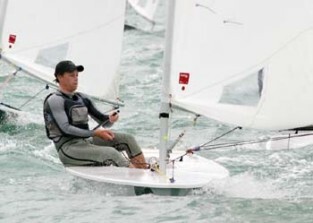 Great Britain was also represented in the Paralympic classes with three British sailors making the trip to Miami to compete in the 2.4mR class and one Sonar team. After winning a bronze medal at the World Disabled Sailing Championships last year, John Robertson and his crew of Stephen Thomas and Hannah Stodel were looking to put in a good performance in Miami. Unfortunately for them a good start was hindered by illness within the team and they were forced to retire from the latter part of the event, moving them down to 11th place overall. The Dutch team of Udo Hessels, Marcel Van De Veen and Mischa Rossen won the class. In the 2.4mR class, British sailor Helena Lucas, who has made the recent transition from the 470 class, competed in her first event and was encouraged to finish seventh overall with team mate Allan Smith finishing in ninth place. The majority of RYA Team GBR will now head back to Europe to compete in their individual class World and European championships as well as a number of Olympic Class Regattas.